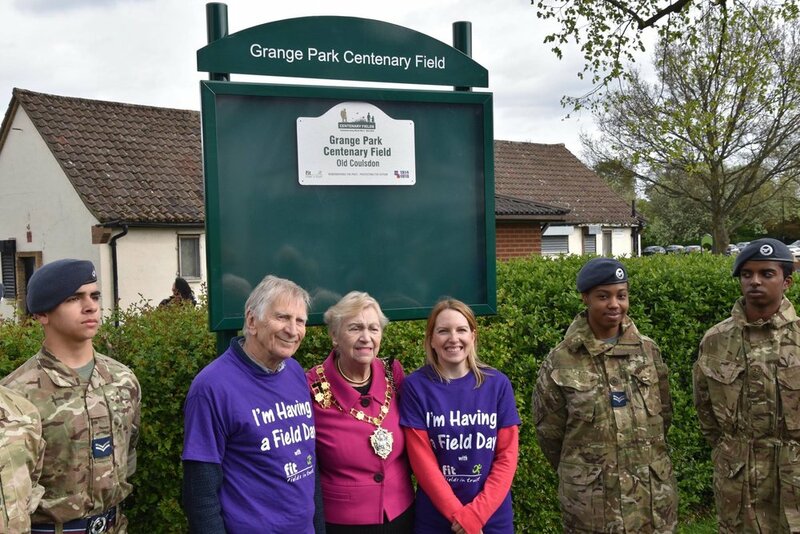 Grange Park is now a 'Centenary Field' following a campaign by the Friends of Grange Park. A dedication event took place on Saturday 15th April at 10.45 a.m. with The Mayor of Croydon, Toni Letts, Cllr Chris Wright (Chairman of the Friends) and Hannah Price-Harries (Vice-Chair of the Friends) before the annual Easter Eggstravaganza opened at 11 a.m.
Run by national charity Fields in Trust, in partnership with The Royal British Legion, Centenary Fields aims to protect war memorial playing fields, parks and green spaces in memory of those who lost their lives during World War I. This national programme is a unique way to commemorate the centenary of World War I. It gives land owners such as Croydon Council the opportunity to dedicate space to remember the sacrifices of those who gave their lives during the conflict, but also to ensure that future generations have valuable green space to enjoy as a living legacy. Grange Park will become known as ‘Grange Park Centenary Field’, and the park will be legally protected to safeguard this beautiful area from development through this initiative led by Fields in Trust. We are sure you will appreciate our extensive efforts to protect Grange Park for future generations.